Carina Mac Laughlan is an equine fine art photographer, highly dedicated in abused horse rehabilitation. 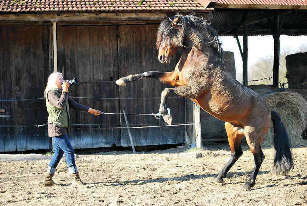 Carina is fully devoted to the horses brought to light in her pictures. Although Carina,s horses were accused and convicted, she emancipated them, freeing them with her care, allowing them the expresion of harmony and compassion to their wildness. She witnessed their recovery, after they had been abused,discarded,and misunderstood, they improved and became breathtaking. Her secret: a conjunction of mutual respect, care, loyalty and faithful love, always keeping in mind that they are horses, no more, no less. Her artwork reveals stunning stallions’ natural beauty, explores their souls, and reveals their essence and reminds us that horse is man’s noblest conquest, a conquest which requires respect and awareness.